Casio America, Inc. has announced the addition of a new Ladies Solar Runner timepiece to its portfolio – the STLS300H. Perfect for hitting the treadmill or running outside in the summer sun, this affordable model features solar-powered operation and a 120-lap memory stopwatch, accessible through a large and convenient front button, which is ideal for training purposes. Powered by Light, the STLS300H uses Casio's Tough Solar Power technology which eliminates the need for frequent battery changes. After a full-charge, each timepiece has a battery life of approximately three months without further exposure to light. It can even be charged in low or fluorescent light. "Casio's new Ladies Solar Runner timepiece combines great features like our Tough Solar Power with a simple layout for seamless use while running," said David Johnson, Vice President of Casio America, Inc.'s Timepiece Division. "Whether you're pacing out personal records or jogging down the beach, the STLS300H was designed to be the perfect companion for running enthusiasts of any level." In addition, this Ladies Solar Runner timepiece features a 120-lap memory stopwatch function with a large and convenient front button for seamless operation during sprints and long distance runs. The STLS300H also features four daily alarms, a 1/100 second stopwatch, a countdown timer, world time for 48 different cities, and water resistance up to 100 meters. Casio's STLS300H features a round display face and large, high-contrast numbers making it easy to read and aesthetically pleasing to the eye. It also comes equipped with a LED backlight so wearers can view information in low-light conditions. Designed in multiple color options, the STLS300H-1A and the STLS300H-1B, have black case and black resin bands with blue and orange features respectively; and the STLS300H-4A mixes it up with a white case and a silver-toned band with pink accents. The STLS300H timepieces are available now at select retailers nationwide for a MSRP of $49.95. For more information on Casio's timepieces, please visit www.Casio.com. 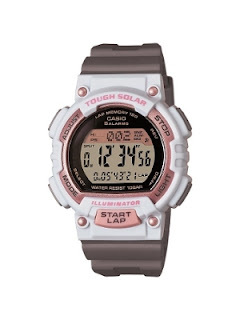 0 comments on "Casio STLS300H Features Three Color Options -- Solar Powered Operation and 100M Water Resistance"